Spring has sprung. That means we can bring out the white shoes! Although there is some debate about whether or not that rule is still in effect. Either way, we (or our kids) are likely going to be wearing shoes soon that can get scuffed. I used to spend so much time trying to get scuff marks out of shoes. I tried everything. Shoe polish. Toothpaste. Even elbow grease. But, so far nothing has worked better than the good ol’ Magic Eraser (even though it’s been sitting in my drawer for two years!). All you have to do is wet the Magic Eraser, rub the scuff off, and dry. That’s it! I’m all about making it easy! Have you found another easy way to clean the scuff marks off of your shoes? Or, do you have another use for the Magic Eraser? I LOVE these!! But I did not know this. Going to try it tomorrow!! Unless there are deep scuffs, I use baby wipes, especially on sneakers. 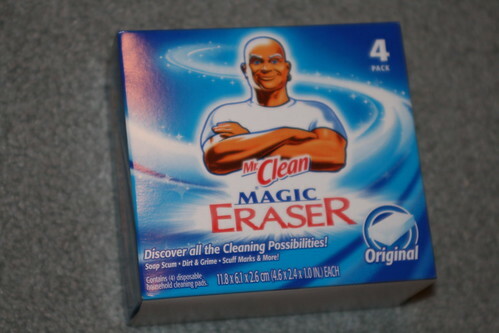 I never thought to use Magic Eraser. I will try it! I have kids shoes to do… hmmm…. .-= Anne Alagna´s last blog ..Stampin a bit here and there =-. I’ve never tried baby wipes. What a great idea! Especially since quite a few of us have those with us 24/7! BUT, the BEST thing that I found to use them for was…. Gettting the grout cleaned in your bathroom!! Works like a charm . Oh, what a fantastic tip! I really need to clean my grout so I’m going to try this soon! !